Thermogenesis and craving/satiety support in one product. This product contains botanical extracts to support two areas of human physiology that help regulate control of body weight: the central nervous system and peripheral energy generating systems. DIRECTIONS: Take one (1) capsule one (1) to three (3) times per day with an 8 oz (240 mL) glass of water, 30 minutes before meals. Commence with a low dose and build up to the most comfortable dosage level. 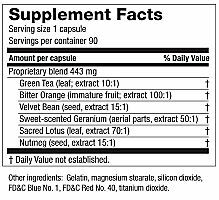 DO NOT EXCEED A DOSAGE OF 3 CAPSULES PER DAY OR TAKE MORE THAN ONE CAPSULE AT A TIME. WAIT AT LEAST 4 HOURS BETWEEN DOSES. NOT FOR SALE TO, OR USE BY, PERSONS UNDER THE AGE OF 18. KEEP OUT OF THE REACH OF CHILDREN! STORE AT ROOM TEMPERATURE (59°F - 86°F) IN A DRY PLACE AND KEEP TIGHTLY CLOSED. AVOID DRIVING OR OPERATING MACHINERY DRIVING UNTIL YOU KNOW HOW THIS PRODUCT AFFECTS YOU!